Many ladies from FBFC joined together to fellowship. A fun time was had by all! 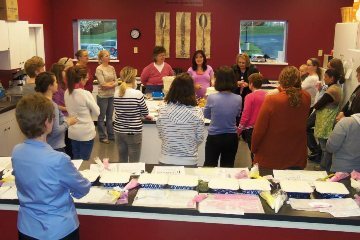 A group of ladies gathered together on April 24th to learn how to decorate a cake. The event was a lot of fun! The ladies were taught some basic cake decorating skills by Jacque Hess and then were given time to practice those skills. At the end of the night each lady got to decorate their own cake and take it home to share. Thanks Jacque and the Moms of Faith group!